Join Monte Verde Vineyards for our last wine tasting and "Los Amigos" wine club pick-up for 2009! This event is for anyone who likes to drink wine... We are celebrating and giving thanks to all the wonderful people who have shared with us in the enjoyment of wine. Come out and visit us one more time! We have a special day planned, and limited quantities of our award winning wine. Holiday gift baskets, Spanish treats, and library wines, are part of our farewell to 2009. The Newcastle Brothers will be performing live, rockin' tunes to give cheers to 2009. Ladies, Celebrate one last time in 2009! Call those girlfriends who need a night out, we're ready to party and and have a great time! Our friends at Morgan Hill Jewelers have donated our Grand Prize! Your $20 fee includes two glasses of wine, light snacks and our chocolate fondue! Raffle prizes and fun suprises make the night extra nice. No need to worry if you have not played before, soon you'll be shouting "Bunco" and winning some more. Lets play one more time in 2009! Please rsvp by 10/14. Email us for any questions. Hope to see you then! 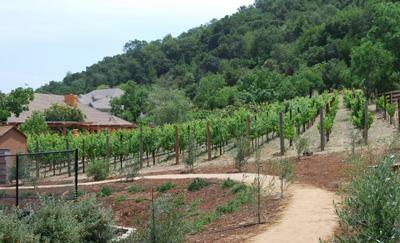 Monte Verde Vineyards is hanging onto Summer a bit longer! We'll be celebrating the sunshine, good wine, food and music. Join us Saturday afternoon, during the Passport Weekend! The awsome band, Rockin' Blues Experience will be performing from 1-4pm. Pork sandwiches (Spanish style, "montaditos" with garlic, bell peper and olive oil) and wines by the glass available for purchase ($5 each), as well as discount bottles and cases! Help us fend off fall for few more days. Have some fun in the sun. *Bring a friend who has yet to try Monte Verde, and you'll be entered into our drawing! * *This event is open to Passport and non-Passport holders! Join us for an evening of wine and music! We'd love to see your smiling face! and bring your "amigos"!